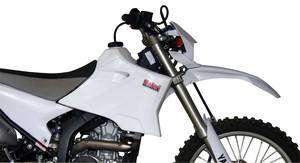 The much-anticipated long rang fuel tank for the Yamaha WR250R, increasing the fuel carrying capacity to 14 litres. The increase almost doubles the capacity of the standard 7.5 litre fuel tank, giving the rider a fuel range of approximately 300-350 kilometres per tank. The tank can be self-fitted, and its strong plastic construction has been made to the stringent quality control that Safari Tanks have become known for. A fuel injection pump transfers fuel from the standard tank to the long range Safari Tank. Note: In Australia, Yamaha Tanks are available only through your local Yamaha dealer, please contact them directly.